Managing delivery is no cake walk. Especially with customers demanding same-day-delivery, greater flexibility and high levels of transparency. Even for the field staff, executing a successful delivery entails more than just picking up and dropping a parcel. There is a series of events that need to fall in place at the right time to ensure successful delivery. Let’s quickly glance through some of the key challenges that supply chain and logistics managers face with regards to deliveries. Was an order picked up when it was supposed to? Who picked it up? What’s the delivery location? Are the delivery executives being productive enough? How efficiently was the delivery being executed? Was the delivery cost-effective? These are some of the concerns that occupy a delivery manager’s mind all the time. And poor visibility into delivery fleet can give managers sleepless nights. Even though it might sound basic but chalking out efficient routes to ensure a seamless delivery can get daunting for supply chain managers. Poor infrastructure, natural calamities (like floods, rainfall, snow, landslides etc. ), speed regulations, high traffic congestion inside cities, fuel consumption, one-way streets and the number of deliveries at a given area all play a crucial role when choosing a delivery route. It’s difficult if not impossible, to consider all these and manually come up with an efficient delivery route. Even something as insignificant as left-turns can make a drastic difference when planning delivery routes. Take this statistic for instance. In the US, 53 percent of all accidents occur at intersections with left turns. Even rainfall can create havoc. According to Edmunds, 46 percent of weather-related crashes in the past decade happened due to rainfall and 17 percent happened due to snowing or sleeting. To optimize delivery execution, it’s important for supply chain managers to accurately document KPIs of delivery fleet and routes. Absence of automation and inability to perform a thorough analysis of historical data pertaining to route efficiency, fuel efficiency, productivity scores of a delivery executive, vehicle idling time and insights into customer feedback make it difficult for business to accurately benchmark KPIs. This can be dangerous. Inaccurate benchmarking of KPIs can cause significant inconsistencies in SLAs. Ensuring better margins and increasing profitability are major concerns that supply chain and logistics managers need to deal with regularly. But lack of digitization and automation in a supply chain results in increased costs in the guise of more human resources, manual errors, inability to scale and inaccurate SLAs. Well, this was just one side of the story. What happens when things go wrong in a delivery process? Do the customers hold a delivery manager responsible for a poor delivery experience? No. It’s always the field staff who face a customer’s wrath. Be it eCommerce or any other on-demand marketplace, any industry that’s heavily dependent on logistics needs to thoroughly understand the challenges their field force face and arm them with both knowledge and technology. The inability to accurately locate a customer’s residence can cause unexpected delays in delivery and in some cases increases risk if the items to be delivered are time-sensitive, like food or medicine. It can also negatively impact a delivery executive's performance score without any fault of his own. If one must make five deliveries in one location and he is running around in an endless maze with the very first one, it’s automatically going to delay the ones that follow. Every delivery executive might not know all the parts of a city well enough. But he will surely have considerable topographic knowledge about certain parts of it. And that’s what matters when it comes to ensuring fast deliveries. But often, due to lack of intelligent tools, business randomly allocate tasks without considering a delivery executive’s area of expertise. In this case, a delivery executive is solely dependent on maps and that might not be enough to ensure a hassle-free delivery. To loop in more customers and fight competition, businesses today are frequently offering free deliveries if the delivery exceeds a certain duration. That’s good. But what if your delivery executive finds himself stuck in hour-long traffic congestion. His first instinct will be to look for a faster route. But then how can he be sure that, that route will be any better or there will not be any unexpected stoppages. A business’s inability to help its field force with enough real-time knowledge about a delivery route always results in hurting the latter's productivity and a customer’s delivery experience. 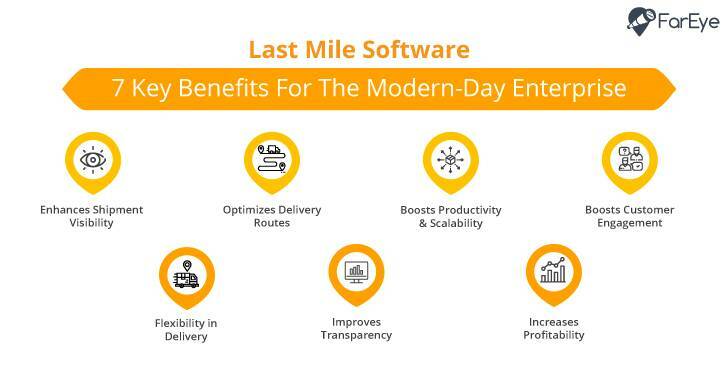 To address these challenges businesses need to invest in a robust last mile delivery software that will empower delivery managers not only to do their job well but also arm the field force with enough knowledge that will help them perform better.